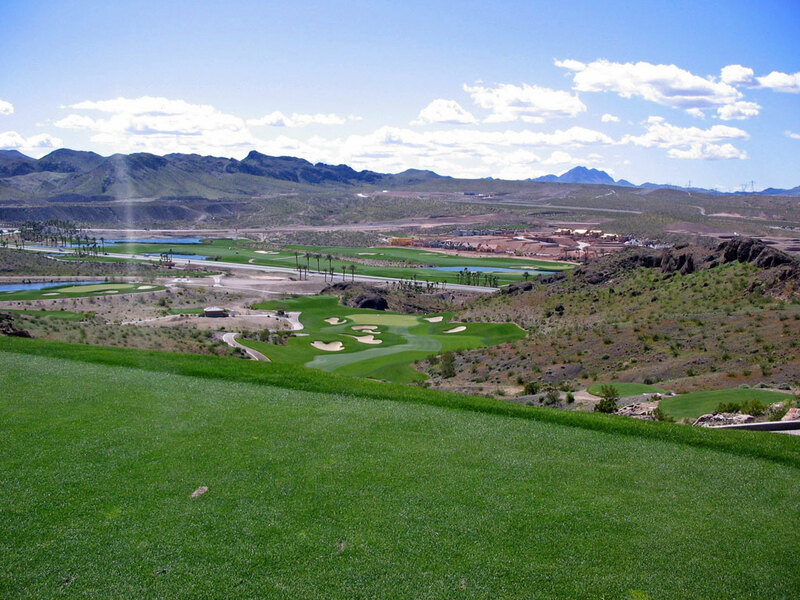 Accolades: Ranked 9th Best New Upscale Public Course in 2003 by Golf Digest. What to Expect: Firm and fast is what The Falls enjoyed while it was open. Stay tuned to see if this Tom Weiskopf gem is resurrected. Signature Hole: 13th Hole – 388 Yard Par 4 – The signature hole at The Falls rests in the middle of a fantastic three hole stretch. 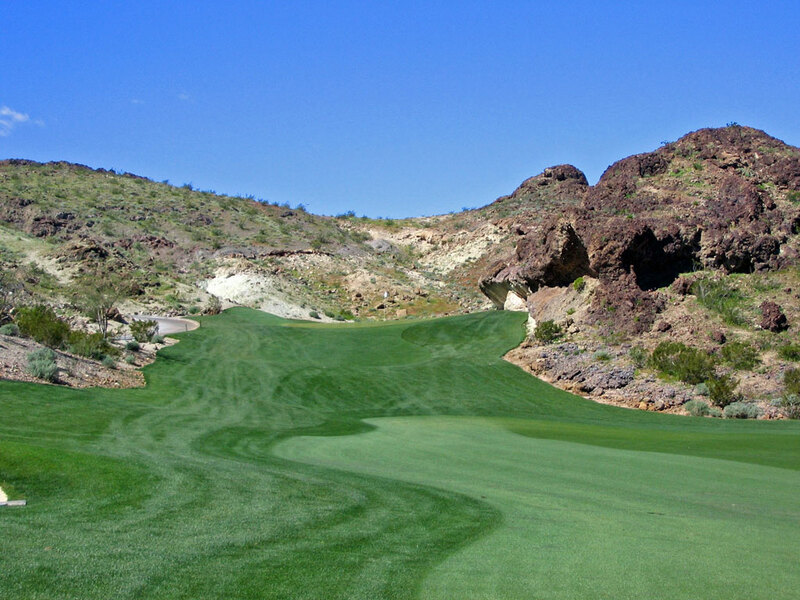 With a natural arch rock formation on the inside of the dogleg right hole, this hole is a beauty from start to finish. 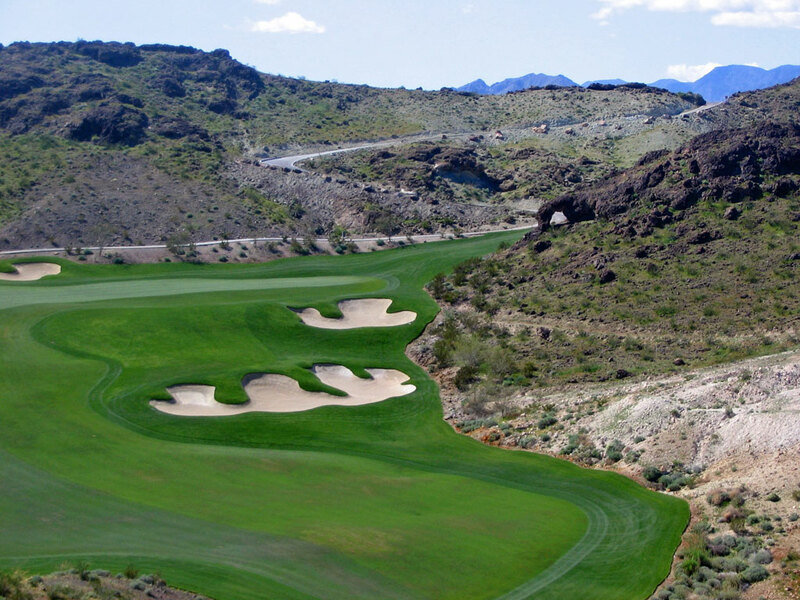 Three bunkers are found on the hole, two on the inside of the dogleg and one on the outside, leaving the green to be protected by the natrual desert landscape. Special care should be taken when hitting your approach to this skinny green since the front edge falls off hard and fast and can run several yards back down the fairway. 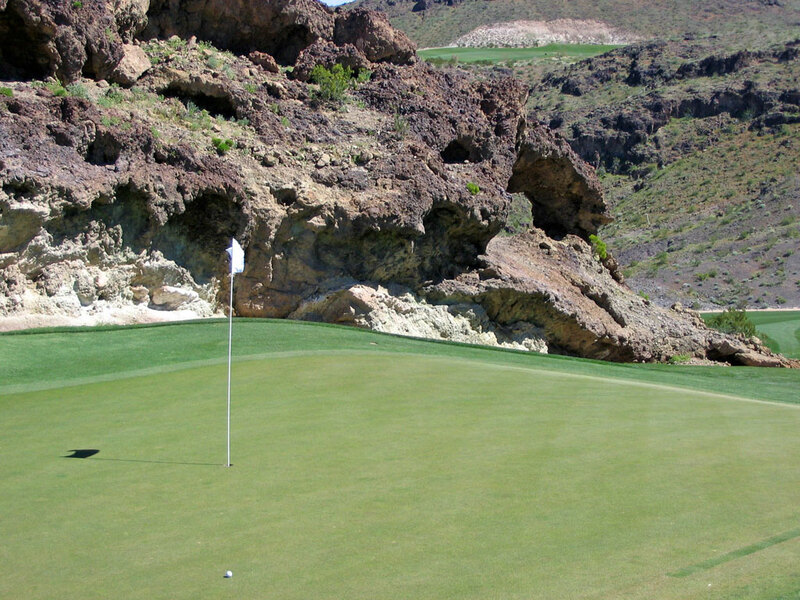 Best Par 3: 16th Hole – 222 Yards – The final par three of the day is also the best. 222 yards from the back tee, this long hole features water along the left side of the green and a series of four bunkers that start at the front of the green and wrap around to the right of the hole. A landing area is offered for players wishing to layup short and right of the green, while those going for the pin need to at least carry the first bunker in order to get a kick off the downslope towards the putting surface. Best Par 4: 13th Hole – 388 Yards – Already featured as the signature hole, the 13th is not only pretty but it can be brutal. As the photo below conveys, the slope off the front of this green is treacherous. Since a wedge or low iron is the likely club to be used when attacking this green, the golfer must be sure to control their spin on the ball and be deadly accurate with their distance in order to have a chance at par or better. A front pin placement can be deadly when the greens are firm and fast. Best Par 5: 12th Hole – 553 Yards – The 12th hole is the first of The Falls' best three hole stretch on the course. 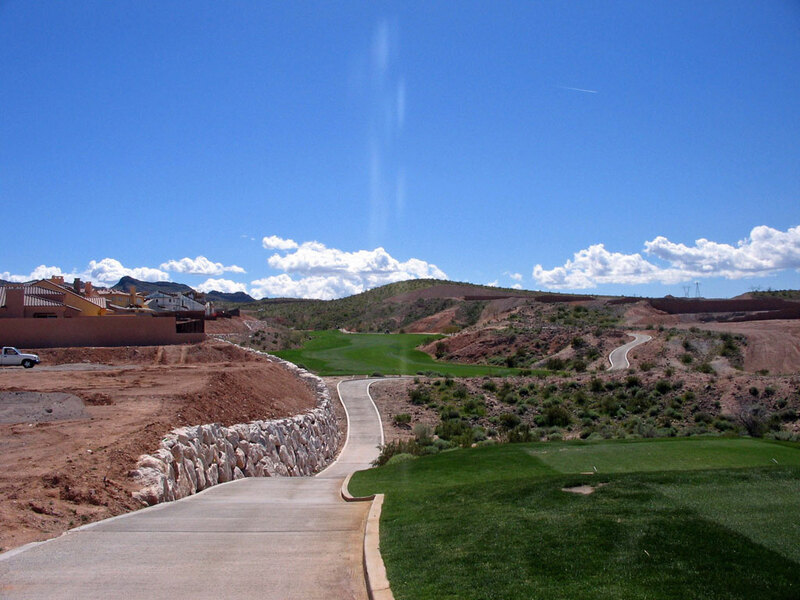 The 553 yard hole plays as a dogleg left and climbs uphill the whole way home. 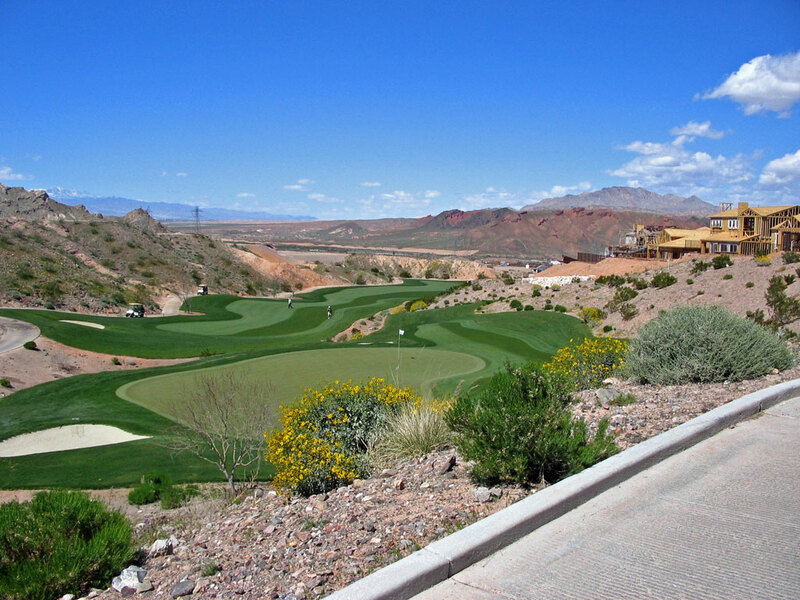 The uphill green is out of view for much of the hole but once the golfer arrives he is presented with the best views of the course and a panoramic shot of the Las Vegas strip. A extensive bunker runs the left side of the green and wraps around the back to help hold balls from cascading down the cliff side. 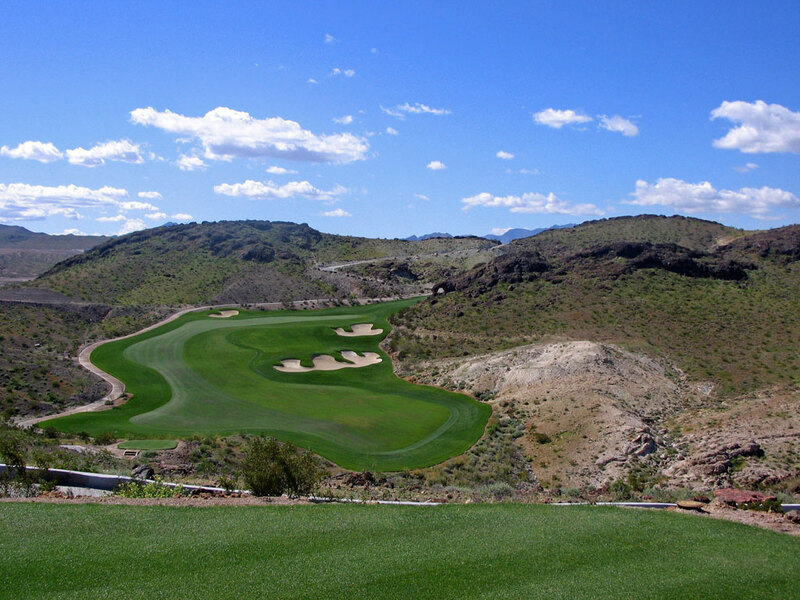 Birdie Time: 14th Hole – 336 Yard Par 4 – 14th - 336 Par 4 - Several architects have their favorite "pet holes" they will incorporate in their designs, and for Tom Weiskopf it is the driveable par four. Birdies should abound at this severely downhill hole with a large opening to the green up the right side. Although seven bunkers are scattered throughout the hole, this is a great chance to tee it high and let it fly so that you can give yourself an eagle putt or at least a modest length up and down for birdie. Bogey Beware: 7th Hole – 519 Yard Par 5 – When a golfer is faced with a tight fairway or narrow aiming point, their muscles often tighten up and a tense swing is made which finishes with less than desirable results. The tight 519 yard par five 7th hole does just that. 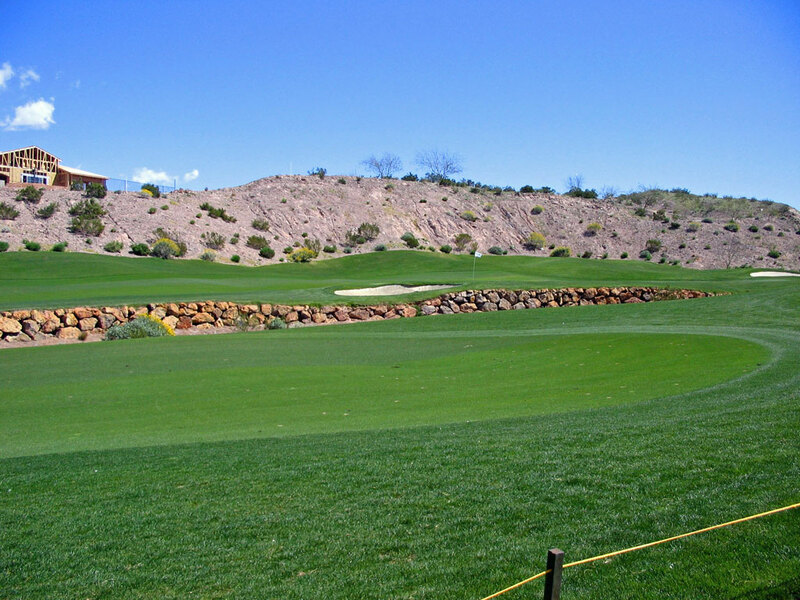 Surrounded by desert on both sides of the hole the entire length, the final obstacle in reaching the green is the desert wash that seperates the fairway from the putting surface and requires players to use a high lofted approach shot before finishing out the hole.